Calling PNC Park in Pittsburgh the best ballpark in baseball doesn’t offend too many people. 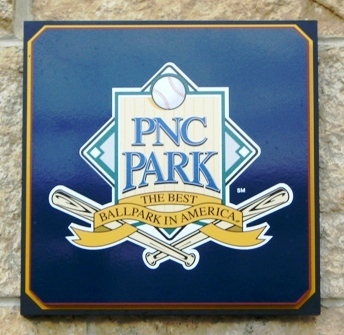 At the gorgeous home of the Pirates, you will often see signs around the ballpark proclaiming it to be “The Best Ballpark in America”. As far as I know, there’s no outrage about this from fans of other ballparks. What if the Cubs put such signs around the outside of Wrigley Field? Might Red Sox fans sneer a little bit? And vice versa, if signs appeared around Fenway Park proclaiming it to be the best ballpark in the country, would that not get a reaction from Cubs fans? Just a thought. As someone who has visited a few ballparks but not all of them, I can say that while the question of whether PNC Park is the “best ballpark in baseball” may be debatable, one wouldn’t have too much trouble making the case. There’s a lot of obvious things to love about PNC. The view, for one. It’s the bridge. The bridge makes it. 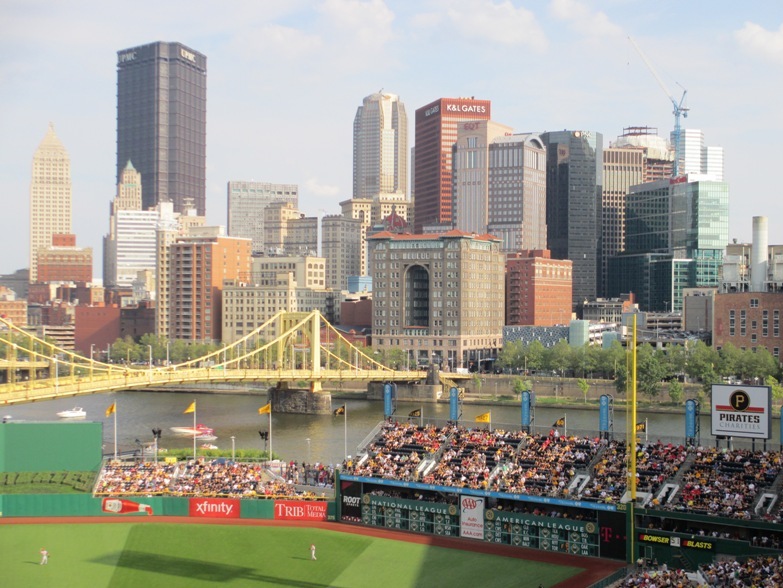 From almost any section in the ballpark there is the stunning vista of the downtown Point area of Pittsburgh, linked to the ballpark itself by the Roberto Clemente Bridge painted in Pirates/Steelers/Penguins gold, crossing the Allegheny River. 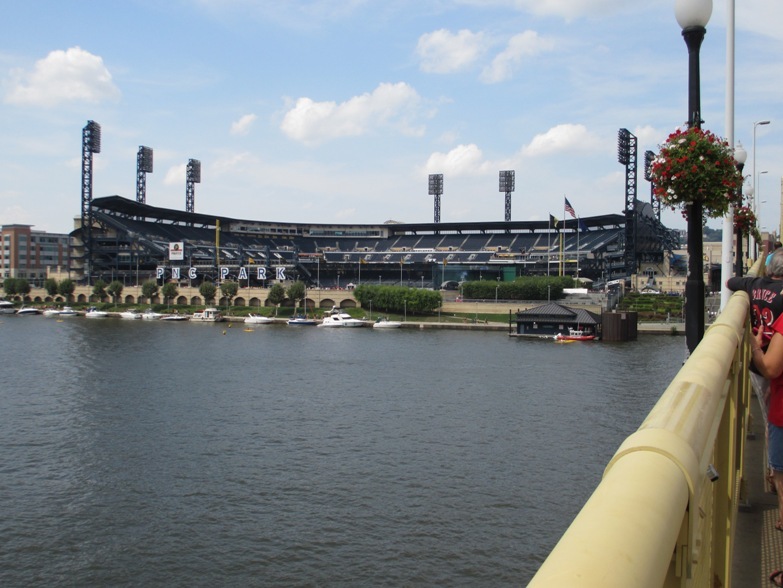 And the approach to the ballpark from downtown is as classic baseball as it gets—a walk across the Clemente Bridge past vendors hawking snacks and apparel, with the open air and dark blue seats in full view while crossing the Allegheny River by foot. Few ballparks if any could match that. I would pay for this view, but don’t tell the city that. Then there’s the ballpark itself—Kasota limestone on the outside; the statues of Bucs greats Clemente, Stargell, Wagner and Maz; the rotunda in left field with views of the ballpark and the city; and the intimacy of just 38,000 seats, painted dark blue in homage to Forbes Field. And there are some not so obvious things too. There’s the matter of the price of tickets, which may not be a fair attribute to discuss given that the Bucs didn’t secure a winning season there until 2013. Best ballpark in baseball? Not even a discussion? Wrigley? AT&T? But poor performance on the field didn’t stop the Cubs from charging a chunk of change to get into the ballpark for many years. 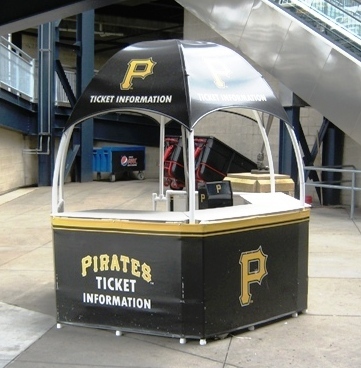 From the most to least expensive seats, Pirates games are competitive in price with any team in baseball. The architects of PNC Park did a tremendous job building intimacy into the place. The ballpark was not only built with a small amount of seats, it was done without raising the upper level to nosebleed height as it is in many new ballparks. The Pirates brag that the highest seat is only 88 feet from the field, and there’s no question that you’re still on top of the action even in the upper deck. This is something that no ballpark built since has achieved, at least none of the ones that I have visited. 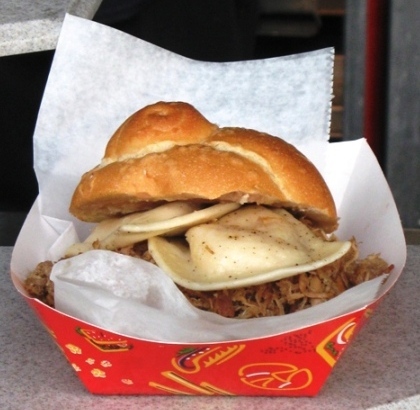 Sure, you could have thought of pierogies in a pulled pork sandwich. But you didn’t. There’s food selections of all kinds, from the venerable Pittsburgh favorite Primanti Bros. to Chickie’s and Pete’s fries to the new BRGR burger joint. You may not necessarily love the idea of a pulled pork sandwich with pierogies on it, but you can’t deny the Pittsburgh-ness of that. And there’s Iron City beer…nothing makes a ballpark like a bad local beer. Finally, I’ve been to ballparks with better food and better access. But PNC is pretty easy to get to by car, and you have the option of using a bus, train or even a boat. Heck, you could ride a bicycle there along the Riverwalk and that would be pretty cool. But to this observer that isn’t all that important. It’s not easy to get to Wrigley Field, but I don’t care once I see the ivy and ancient scoreboard. And when in Fenway Park, a Fenway Frank tastes as good as any gourmet meal anywhere else. I have yet to see AT&T Park, Safeco Field, Target Field or Coors Field, all of which have been touted as the best in America. Of the ballparks I have visited, I’m partial to Camden Yards, Wrigley Field, Fenway Park—and without doubt, PNC Park in Pittsburgh. On almost every level, PNC is as good as or better than all of them. So if you ask the writer of Ballpark E-Guides whether PNC Park is the Best Ballpark in Baseball, my answer is: if you think so, I won’t argue with you.